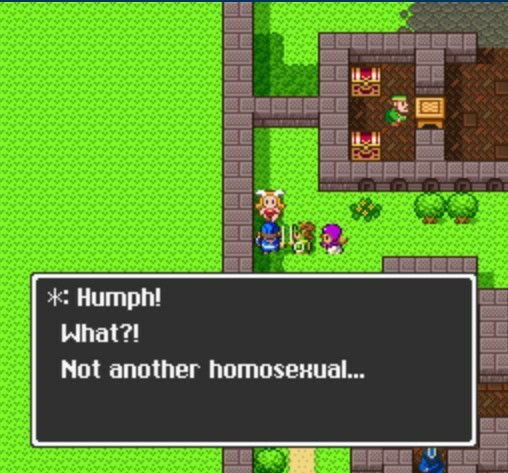 Dragon Warrior III features a sexual activity called puff-puff. The name is allegedly based on the Japanese onomatopoetic term “pafupafu,” which refers to a woman rubbing her breasts in a man’s face. Occasionally, non-playable female characters ask the (male) playable protagonist to engage in puff-puff, which he can accept or refuse. If he refuses, female NPC’s react differently. According to one review, in one case in which the player refuses the puff-puff proposal, the woman replies: “Hmph! What?! Not another homosexual…” (Princess Gwaelin at Inns, Coffins, PUFF PUFF, Wellgarth Inn, 2012). This entry was posted in 1980s, Homophobia, Homophobia/Transphobia, Mentions, Mentions (explicit) on August 23, 2015 by Adrienne Shaw.